­­­­A priest friend collects Nativity sets from around the world — China, Peru, Germany, Uganda … just to name four of the more than 50 countries in his collection. During the Christmas season, they are displayed in the parish hall for the enjoyment of the parishioners. As I walked around the beautifully arranged display, I was fascinated by the cultural aspects (Asian, Latino, African, European, etc.) that are peculiar to each representation of the Bethlehem scene. The colors and designs of the clothing in which the familiar figures of Mary, Joseph, shepherds, angels and Jesus are dressed are native to the respective countries. Additionally, the scenes of each set are native to and represent the country of origin. These details clearly proclaim that through the birth of Jesus, God appears for all peoples everywhere. The angels proclaimed to the shepherds that Jesus’ birth is Good News for the whole world. God’s Eternal Son born into time in Bethlehem of Judea, the event that we celebrate and remember each Christmas…. AND God’s Son born into the life of each believer whoever he or she may be, wherever they may be from. What impressed me the most about the variety of those Nativity sets was the depiction of the Infant Jesus — the Baby. A sleeping infant … whether Asian, Latino, Black, Native American, European, etc. He is the center of each scene. A baby is a baby is a baby … matters not the culture, language or country. Irresistible, adorable, tender, soft, dependent. An infant makes no judgements; reaches out to be held, to be cared for. The Infant Jesus has no words but is God’s Word. He is God made small for us. God made one of us. He is God — Savior; God — Lord; God — Prince of Peace; God — Messiah; God — visible; God — so easily available to us because He is one of us. He is the Son of God made flesh; made human. He is the Christ of God who is born at a specific time when “Quirinius was governor of Syria” (Luke 2:2) and in a specific place, “the city of David that is called Bethlehem” (Luke 2:4), but who belongs to every nation, to every people, to all times and cultures. God, one of us. God with us. God Emmanuel. This is the mystery we celebrate at Christmas: the appearance of God in human flesh. God dwells among us. Not from a distance; nor outside our human experience; not beyond us; not remote. The Savior is born for all women and men. NO one is excluded from such an outpouring of Divine Love. The Infant Jesus is easy to love, easy to respond to. Unfortunately, some people exclude themselves from God’s love. Pope Francis wrote: “The power of this Child, Son of God and Son of Mary, is not the power of this world, based on might and wealth; it is the power of love. This power of love led Jesus Christ to strip himself of His glory and become man.” The Infant Jesus of Bethlehem is God’s love made one of us; flesh of our flesh; bone of our bones; blood of our blood. Love Him and allow Him to love you and you will have a Merry Christmas. May you, your family and your loved ones experience this closeness of God during this Christmas. May the nearness of God in the Infant Babe of Bethlehem touch your life with the Peace of God and with the power of Christ’s love. At my Christmas Masses and during the Christmas season, I will pray for you and ask that you do the same for me. May the Blessings of this Christmas Season be with you into 2019. 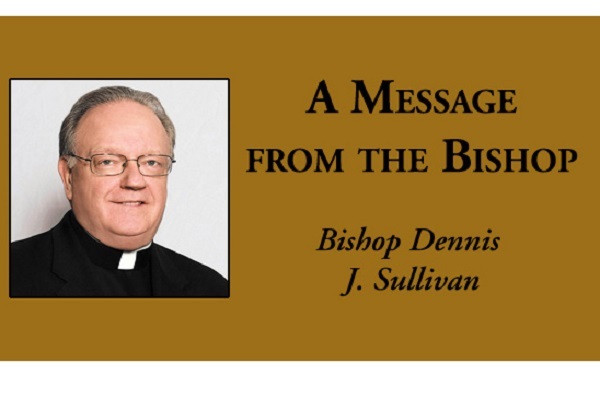 Most Reverend Dennis Sullivan, D.D.